An Articulate user asked us a great question recently. She wanted to build an Articulate Quizmaker ‘09 quiz consisting of three paths, with each path containing a different group of scenario-related questions. Rather than make all of her learners complete all the questions, she wanted to let each learner choose just one of the paths at the beginning of the quiz. Although it’s not mandatory, separating your questions into groups makes it much easier to visually organize them when you're creating your content. By default, whenever you start a new quiz it contains a single question group, and all your questions end up there. But you can easily add more groups and reorganize your questions to be in whichever groups you want. 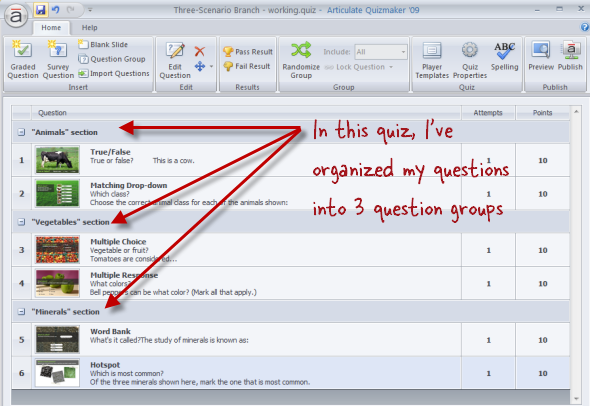 Quizmaker adds a new group header to your question list. Double-click the group name if you want to change it to something more intuitive. You’re the only one who will see the name—it won’t appear to learners—so you can call it anything you like. 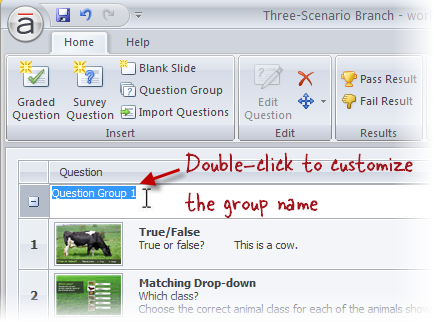 Now create your questions, and drag each one into the appropriate group. You can also rearrange the order of the question groups themselves if you want—just click and drag the group header to a different place in the question list, and any questions in that group will travel together. 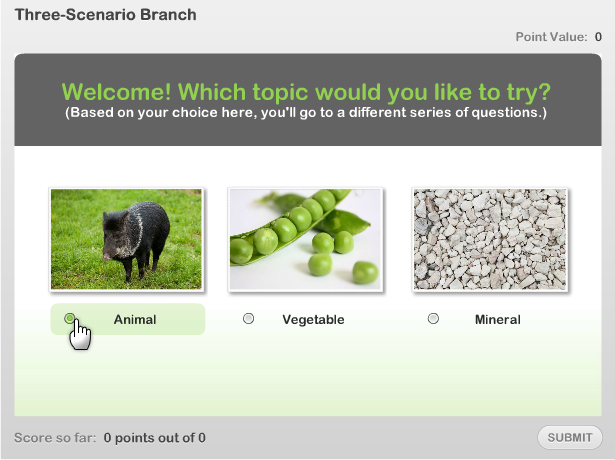 On the survey question at the beginning, you’ll add branching on each of the three choices, so that learners jump to the right questions, based on their choice. That’s all there is to it! If you choose to include a result slide at the end, the score that appears there is based on only the questions the learner answered (not the entire lot of questions in the quiz). So in my example below, even though my quiz actually contains six graded questions worth 10 points apiece, the learner’s score is based on just the two questions (20 points) that comprise the question group they complete. And if you include a Review Quiz button on your result slide, during the quiz review your learners will only see the questions they answered (not the questions that were part of the other question groups). Below is a sample of the published quiz, and you can also download the source file if you’d like to deconstruct. G R E A T ! ! ! Thanks a lot, Jeanette! Great reminder of the strength of Quizmaker. Thanks! Merci Jeanette comme toujours votre démo est très professionnelle et très utile pour moi qui apprend Quizmaker, Bravo. Thanks for this sample. Modified an existing quiz, followed directions, and good to go. Clear, concise directions, as always JB! Fantastic - really helped on a project I'm working on! Hi Kevin! Yes, that's correct, the learner is graded on the questions they answer, and not the questions they skip. Regarding your other inquiry, currently it's not possible to branch the learner away from a question to a remediation slide, and then bring them back to the same question for a retry. (Once they leave the question, their answer has been submitted and scored.) As you mentioned, sometimes what folks do is create a duplicate of the question slide, and take learners there after remediation (essentially making it feel to the learner like they're getting a retry), but as you've discovered, that introduces some difficulties with scoring - because it means that some users will complete more total questions than others... which can make it difficult to set the passing percentage in a way that fits all situations. If your quiz is simple and you only have one or two questions which might require this sort of remediation, you could perhaps do this: determine the percentage users would achieve in the remedial situation - i.e., if they get the question wrong initially but then get the second version of the question correct... and if you feel that percentage is also an acceptable pass percentage for users who complete fewer questions - i.e., the folks who don't require the remediation - then you could use that value for your pass percentage. Hi Dave! Yeah, if a user were to return and chooses a different path than they chose initially, their new score would replace their initial one. Each time they reach the end of the quiz and hit the Finish button on the result slide, that's considered a discrete "attempt" as far as reporting's concerned. OK, this may apply to what I'm trying to do, but I need some help. I have a 1-hr course that people in multiple offices will be required to re-take every year. For a couple of Multiple Response questions, I have provided customized feedback by grouping the questions, so I can say (in this group) "[Answer XYZ] and [Answer ABC] are the only ones that are correct because...." I have 3 randomized groups. However, I only want the learners to take the question for 1 of the groups each...so 10 people in one office are each getting 1 of 3 different questions/groups, with those choices in random order. Next year they may get the same question set (group) or either of the other 2. What's the best way to do this? Hi Joanne, I'm not sure I'm picturing your quiz correctly, but it sounds like you are wanting to display a different (random) question *group* each time the quiz is launched, and within each group, you want to also display the *questions* in a random order... is that correct? 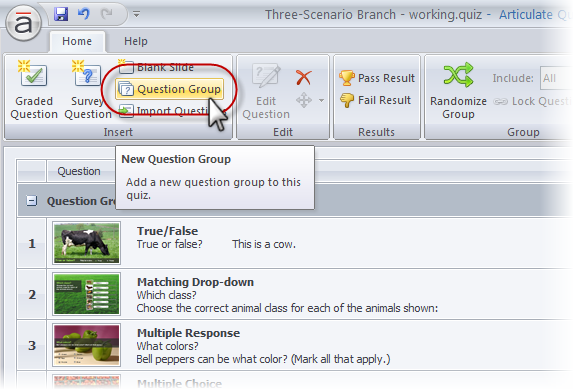 Unfortunately it's not currently possible to randomize question groups in Quizmaker 09 (you can only randomize the questions *within* a group). But if I've not understood your question correctly, maybe you could provide more detail by posting in the Quizmaker forum: https://community.articulate.com/forums/articulate-quizmaker and we could help you brainstorm further. Thanks! Hi Bob - Great idea, thank you for suggesting that! You could certainly use 3 identical blank slides for the "path choice" group, and have each one branch to the beginning of a specific group. I hadn't thought of that! The blank slide could function as an intro to the quiz, and the learner would never even know that there actually 3 versions of the same intro, each leading to a different set of questions. I'm confused. How do the blank slides work--and how do I get the learners to one of those slides? Bob and Jeanette, that is BRILLIANT! Thank you!! This is a handy technique that can be applied to multiple platforms... especially if you can track variables. Already giving me ideas on how I might expand on this to create roll based training. For example, let's say you have tasks A, B, C to train in. Learners may need to master some combination of the above depending on role. Create all training in quizmaker, using non-question slides for presentation content. You then have training modules A, B, C Using a "hub" page in presenter, a user can select their role. Let's say the role requires mastery of tasks A and C. They branch to a "level heading" page for that role. That section of the presentation has 2 slides on it, placing module A on one and module C on the second. Restrict navigation in presenter to force completion of "quiz" before moving on to another slide, but allow free navigation within the quiz module. Each role also has a completion page that sends them to the last slide in presenter so that they can "complete" the course within the LMS. If you can develop in an environment where you can set variables, you can do this even more easily and reliably. This seemed really cool to me and I just attempted to create it. However, I would like to send my user back to the first slide and have them go through all of the groups. When I send the user back to the first slide it is locked because it was already answered. In quiz properties, I set my quiz to 'unlimited answers' but it still will not let the user answer it more than once. Can you think of why this may be? Hi Jessica, right, if you branch them back to the beginning without leaving the quiz, they'll see the questions they've answered already, and they won't be able to change them. But here's a workaround, if you also have Articulate Presenter. You can embed your quiz in a Presenter presentation, and in the slide properties at the bottom of your placeholder slide, you can set the branching for "When user passes" and "when user fails" to go back to the slide before your quiz. Or, another approach is, to leave the branching as the default (which goes to the next slide), and on the slide after your quiz, create a hyperlinked button in PowerPoint that gives them the option of re-doing the quiz if they want, and hyperlink it back to your quiz slide. It's also important that in the quiz itself you turn the resume feature off. You can do this in Quizmaker by going to Player Templates > Edit > Navigation and unmark the "prompt to resume" option. This way, when the learner leaves the quiz and then returns to it, the quiz will refresh itself so the learners can re-answer the questions all over again. I want to create a quiz with different feedback for each answer to question 1a (there are about 5 possible answers). If the learner selects the correct answer to 1a, I want to branch then to question 1b. If they select any of the incorrect choices, I want to branch them to question 2. Is this possible in quizmaker? I seem to only be able to use branching if I select feedback per question, however this only allows me to give 2 possible feedback messages. Hi Jeanette This is a very helpful tip thanks. However, I want to create a tutorial (ie not just a quiz) with branching based on the response to several questions, preferrably entered on the same page. Its rather like clicking on check boxes when applying for insurance online! So for example, I might want to know of a learner : are you in Europe? are you travelling alone? do you have a visa? do you need to know about currency? and I would rather get the answer to this on the first page and take branching from there to informative pages rather than questions. I may also want to use these kind of questioning to further narrow the options later in the tutorial. I am not clear that using quizmaker can help with that - am I wrong?